We are delighted to announce that Professor Yi-Tao Long has joined Chemical Science as an Associate Editor. Yi-Tao is a Professor of Analytical Chemistry at Nanjing University in China. He received his B.S. in Chemistry at Shandong University in 1989 and his Ph.D. under the supervision of Professor Hongyuan Chen from Nanjing University in 1998. 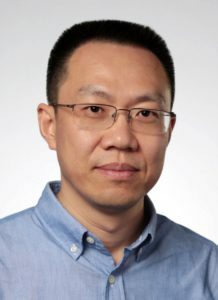 After undertaking two-year postdoctoral studies at Heidelberg University, Yi-Tao worked at the University of Saskatchewan and the University of Alberta in Canada for over five years. Following one more year of research at UC Berkeley, he started his independent career at the East China University of Science and Technology in 2007. Yi-Tao’s research interests focus on the development of new electrochemical measurement methods to reveal the characteristics and dynamics of single entities. This involves nanopore single molecule electroanalysis, biointerface spectroelectrochemistry and integrated biosensors. Yi-Tao looks forward to receiving cutting-edge submissions that lead to the frontiers of analytical science and electrochemistry. Below is a selection of articles published in Chemical Science which Yi-Tao would like to highlight – all free to read! We hope you enjoy them.